Fresh from an acclaimed outing on FACES, Giovanni Damico pops up on Marcel Vogel's inspired Lumberjacks In Hell label. The Italian producer is naturally in fine form here, with A-side "Tanzania" - a breezy, house-friendly rework of what sounds like a Tanzanian boogie cut - being one of the most addictive and life-affirming edits we've heard this month. You'll find more wiggling synthesizer lines on the deliciously dreamy and evocative deep house shuffler "I Need Me", while "Are You Somebody" is a successful exercise in subtly beefing up a low-slung disco-funk number. As if that wasn't enough to set the juices flowing, he completes a brilliant E.P with the jazz-fuelled deep house smokiness of "Humans After All". 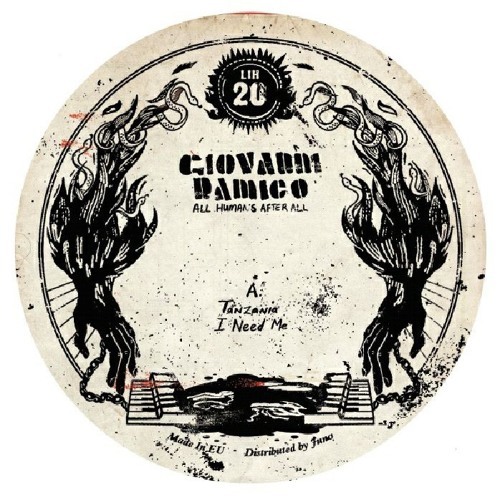 Buy Giovanni Damico - All Humans After All (LiH 20)!! release today !! Users who like Giovanni Damico - All Humans After All (LiH 20)!! release today !! Users who reposted Giovanni Damico - All Humans After All (LiH 20)!! release today ! !